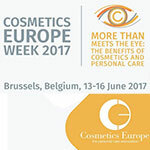 International cosmetics and personal care leaders will gather again in Brussels to discuss global trends and the latest industry developments at Cosmetics Europe Week 2017. The conference, organised annually by the European trade association Cosmetics Europe, will take place on 13-16 June. Under this year’s theme “More than meets the eye: the benefits of cosmetics and personal care”, over 300 industry experts, policy makers, decision makers and companies will explore the contribution of cosmetics to well-being, and to the European economy. They will also delve into the complexities of cosmetics regulation, network and create new business opportunities. John Chave, Director-General of Cosmetics Europe said, “ With 500 million European citizens using cosmetic and personal care products every day, at this year’s Cosmetics Europe Week, we decided to look at the benefits that cosmetic and personal care products bring to our lives. With a line-up of expert speakers, we will address this issue from industry and consumers’ perspectives as well as explore the social and economic dimension .” “ We are very happy to organise the Cosmetics Europe Week for the fourth time and see it growing into the ‘place to be’ for the cosmetics community, a space to freely discuss, share and learn .” he added.